Mozy has recently updated its popular online backup service and it's had a few tweeks, mainly under the hood. The main improvements are faster backup and restore operations and an easier-to-use interface. Installing and using Mozy is very Mac-like. Once you've installed it and chosen your options everything happens in the background, much like Time Machine. Obviously, an initial backup takes lots of time if you have multiple gigabytes to upload, but once it's done the additional backup is fast and, most importantly, invisible. You can get into the software and tinker about with what gets backed up and how much of your bandwidth to use, but if you're happy to just let Mozy work, it does so with minimal fuss. 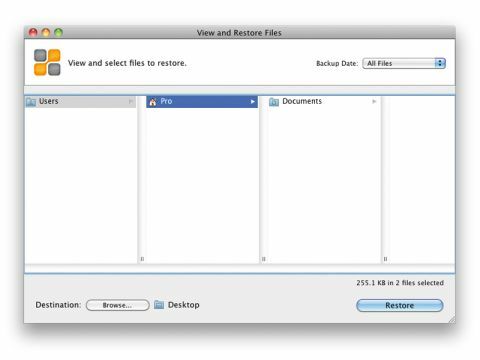 Restoring your data is a similarly easy process. A few times when doing our initial backup, web browsing was a bit jittery with video and the like, but there wasn't any genuine evidence that Mozy was the reason. To see where you are with your backup progress it's a simple case of clicking on the Mozy icon in the toolbar. You can get to the application through the System Preferences pane too, if you'd prefer not to clog up your toolbar. All the data transferred is encrypted for your security and the data centres – where your data is actually held – have the same levels of encryption as a well as serious physical security. All of this comes with the caveat that Mozy is about to put a cap on the monthly upload limit for home accounts and charge extra for more storage. Previously, accounts had been completely unlimited. At the time of writing, Mozy couldn't tell us exactly what the UK prices were, but the new pricing model stands at $5.99 (£3.70) a month for 50GB of storage for one computer, or $9.99 (£6.15) a month for 125GB of storage for up to three computers. To add a machine costs a further $2 (£1.25) a month and each additional 20GB costs $2 (£1.25) as well. As well as the Home edition, there's a Pro version that has a slightly different pricing structure and a more comprehensive support service. A Pro account costs £3.99 a month per machine and 50p per gigabyte per month. If you're not sure about the service, Mozy does offer a free 2GB account that you can use for backup or storage. This service is available even if you choose not to upgrade to one of Mozy's paid-for options. The competition is still offering unlimited backups, but Mozy argues that when users go above a certain amount the service is automatically throttled and becomes too slow to use reliably. Mozy also argues that the limits it has set in place will affect only a few users. Naturally, if competitors such as CrashPlan or Carbonite follow suit then this makes Mozy a touch more competitive, but on the whole it's harder to recommend Mozy, even when taking into account its claim of bandwidth throttling and poor service from other companies that offer unlimited backup services. The Mozy software and service is undeniably good. From installation to first use, even the newest Mac users shouldn't find too many hurdles. However, the coming limitations to Mozy's service may just give you pause for thought.